Who needs another set of wires? Now Apple has got rid of the headphone jack on its iPhone 7 and 7 Plus devices you simply can’t plug in your standard set of wired headphones into the phone anymore without a Lightning adapter. Fortunately, Apple includes one of these with both new phones along with a set of Lightning Ear Pods. But what if you want to get rid of wires altogether, including the Lightning connection? Then you need to buy a pair of Bluetooth wireless headphones or earphones instead. One of the great things with Bluetooth-enabled earphones is they are ideal for those who like to listen to music while taking part in sporting activities such as running or cycling. For example, you can place your smartphone on the treadmill and sprint to your heart’s delights without having to worry about getting the wires all caught up and potentially tripping you up! However, on the downside you can expect to compromise on audio quality a bit as their range is typically limited to around 30ft (about 10metres) – though this is usually enough for smartphone users. Another limiting factor is that Bluetooth earphones tend to be slightly bulkier than their wired counterparts because they have to include batteries. Here we look at 5 pairs of Bluetooth earphones that we definitely think are worth considering, especially for the sports fanatic who wants the extra convenience. All prices correct at the time of going to press (27/1/2017). TAIR is probably not a brand you’ve ever heard of but it makes a number of Bluetooth enabled earphones, including a less attractive, but cheaper, pair in black. However, we really like these green coloured earbuds with the rubberised neckband which makes for very comfortable wearing indeed! 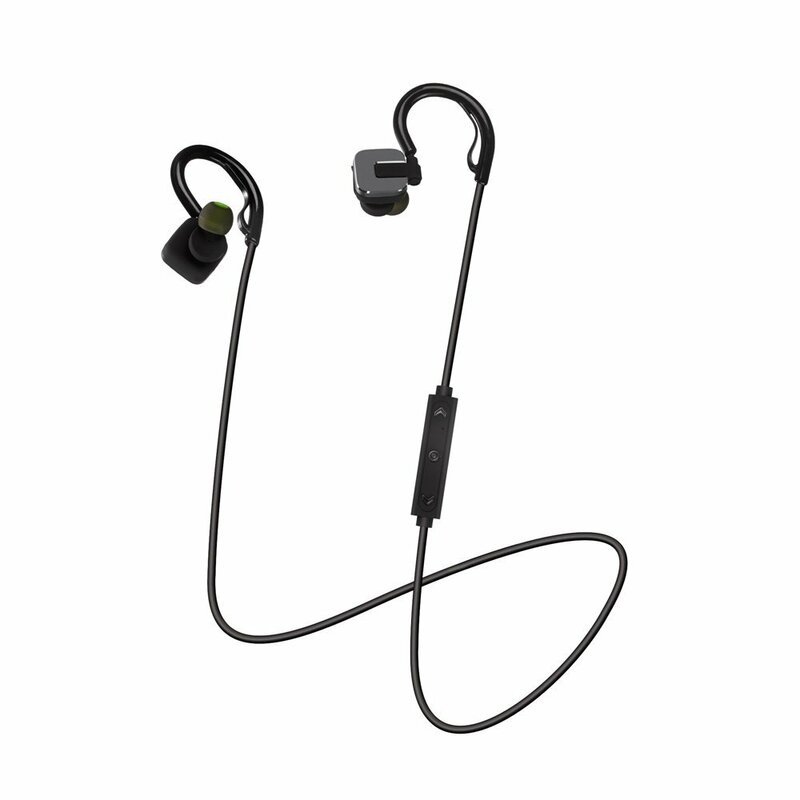 Featuring 4.0 Bluetooth it comes with a battery that can provide playback for up to 8 hours as well as several sizes of ear bud covers to suit different types and sizes ears. Magnetic ends on the stylish earbuds also prevent loss when not in use, while a voice prompt is provided for when the unit is powered on. Although sound isn’t particularly bassy, it is pretty good quality and goes quite loud. Given a price tag of less than £25 these TAIR earphones really are exceptional value for money. Sweat-proof and lightweight, DrBlu wireless bluetooth headsets give you all the benefits and convenience of wireless headphones at the same time as delivering high quality audio. What’s more, the built in microphone allows you to receive and make phone calls wirelessly at distances of up 10m away from your Android or Apple smartphone. DrBlu uses British-Made Chipsets which give you the very latest Bluetooth 4.1 and APT-X technology for close to CD quality sound. Added to this its CVC 6.0 Noise Cancellation technology for clearer audio. Charging time is about 2 hours with about 5 hours of talk or play time and 175 hours in standby mode. 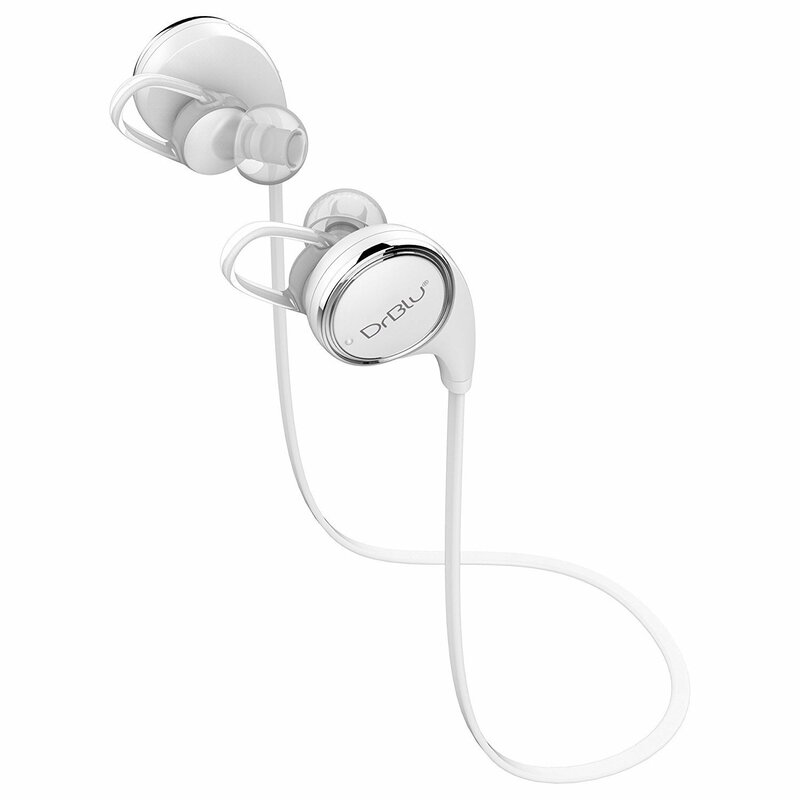 Lightweight, the earphones tip the scales at 16.4g and have a frequency response of between 20Hz and 20KHz. 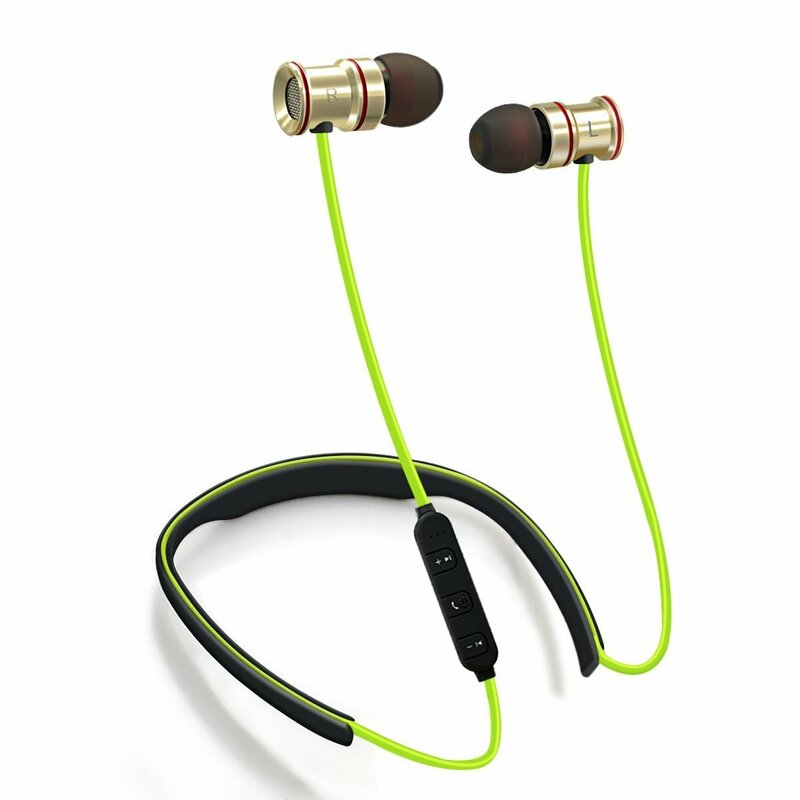 Most Bluetooth earphones are a little on the bulky side as they need to house the necessary batteries somewhere. This was the problem with the predecessor of the Freedom earphones, the X2. However with this latest Freedom design from Jaybird, instead of having the batteries inside each earbud, they’ve been relocated to the remote control. This allows the solid aluminium earbuds to be super small. A sweat-proof design, the earphones come with a variety of earbuds and accessories to help you find the perfect fit while a charging clip provides a further four hours of sound. Using Jaybird’s MySound App you can customise your sound settings and save them to your earphones. However, on the downside the Jaybird Freedom earphones aren’t exactly cheap, currently setting you back the best part of £150. Although we’ve featured the red pair, they are also available in black and gold. Want to go for a run? Or maybe on a bike ride through the park? Or perhaps you need to talk on the phone for a long period of time? 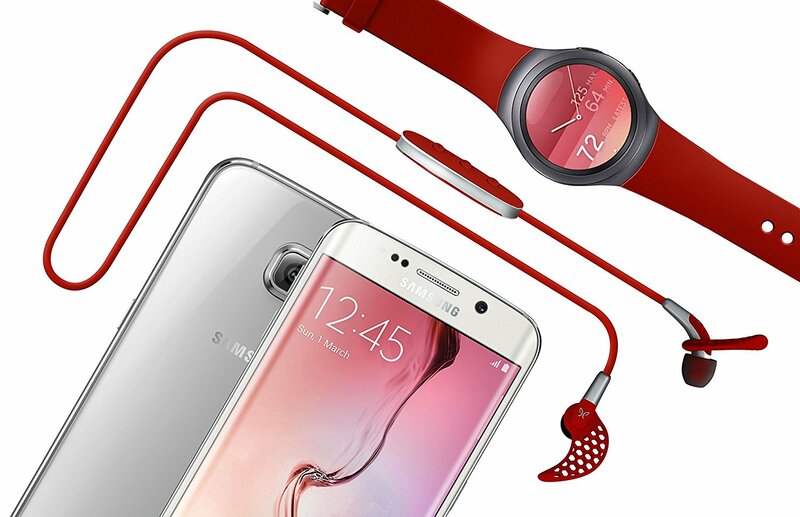 Most other Bluetooth Headphones are done after just 5 hours of battery life. However, the manufacturer claims these ICE-FOX Bluetooth earphones will give you a total of 7 hours of activity before needing to be charged again. Comfortable and well designed, the Ice-Fox comes with three different sizes of ear buds and one pair of ear hooks to stay in place during wear. On board is also a built-in HD microphone complete with APT-X + EDR audio decode technology and CVC 6.0 noise cancellation technology for improved sound. What’s more, these Bluetooth earphones from ICE-FOX can pair up to two different Bluetooth devices at the same time and are packaged with an outdoor sport fit stabiliser. Given the low price tag, they really are great value for money. 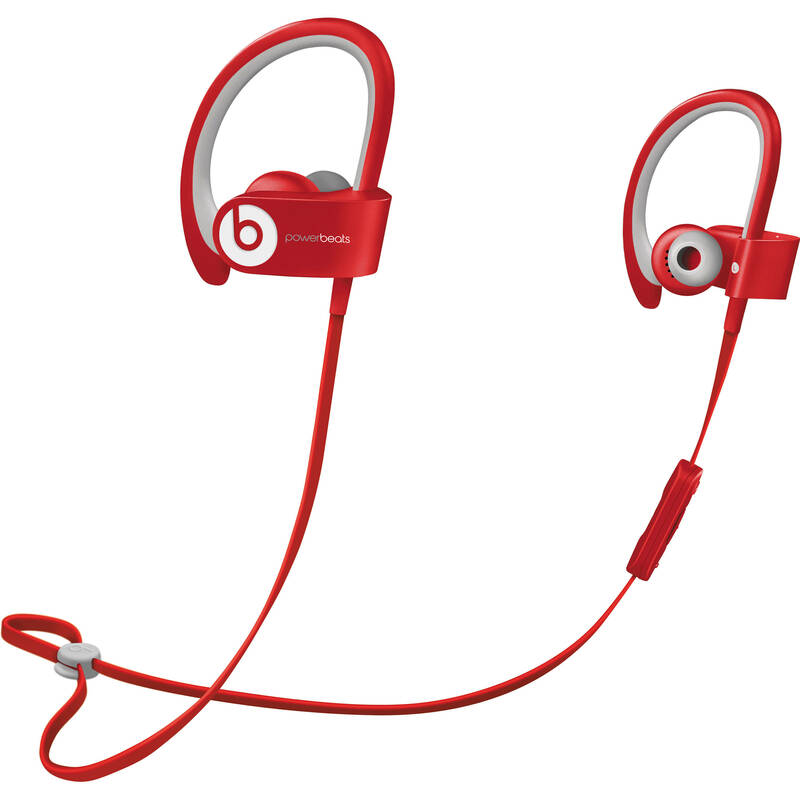 A Bluetooth version of the company’s popular Powerbeats sports earphones, this model would have originally set you back the best part of £170. However, it’s now been reduced in Currys by £60, making it a little more affordable. Designed for running, cycling or gym workouts, the Powerbeats² Headphones are completely sweat resistant and will also let in ambient noise to keep you safe on the road while you’re enjoying music. There’s a built-in mic for phone calls or online chat, and the tangle-free RemoteTalk cable lets you control your phone or audio device through a set of easy-to-use buttons located on the cable. A rechargeable battery with 6-hour playback gives you all the power in you need while if you’re on empty, a 15-minute quick charge delivers an extra hour of non-stop playback. Mysterious printing syndrome spreading worldwide!